John McCain III attended a private boarding school, where he was nicknamed "McNasty" for his willingness to fight. Later, at the US Naval Academy, he gained a reputation as a ladies' man, complained that he was picked on by his commanding officer, and graduated 894th out of 899 in his class. After flight training, young McCain flew A-4 Skyhawk attack aircraft in the Vietnam war. On his 23rd mission, an October 1967 attack on a Hanoi power plant, his plane was shot down, and McCain, with three broken bones, was imprisoned in the famous "Hanoi Hilton." Under duress, he was interviewed by French reporters, and told them he was treated well. In an interview broadcast as propaganda in Hanoi, McCain said he had bombed civilian targets. He was offered early release because of his father's high rank, and McCain says he considered it but declined. After that, he was tortured for four days, until he signed a confession: "I am a black criminal and I have performed the deeds of an air pirate. I almost died and the Vietnamese people saved my life, thanks to the doctors." Of his more than five years in prisoner-of-war camps, nearly two of those years were spent in solitary confinement. After the war McCain needed extensive surgery to repair the clumsy medical treatment he had received from his captors, and he underwent years of physical therapy to be able to walk normally. He remains unable to lift his arms over his head. His military medical records show that military doctors were impressed by his quick psychological recovery. For his military service, McCain won the Silver Star, Bronze Star, Legion of Merit, Purple Heart and Distinguished Flying Cross. His father was a four-star admiral in the US Navy, as was his grandfather. The first Admiral McCain was commander of all US carriers in the Pacific during World War II, stood at attention on the USS Missouri when the Japanese surrendered, and died of a heart attack four days later. The second Admiral McCain was CINCPAC (Commander-in-Chief, Pacific Command) of all US forces in Vietnam. A McCain ancestor served on George Washington's staff during the Revolutionary War, and after the family had relocated to Mississippi several McCains fought for the Confederacy in the Civil War. His mother, a wealthy oil heiress, has been described as "the Auntie Mame of Navy wives." The family still chuckles about the day she went on an errand to buy a new dress, and came home with a new Mercedes instead. A bit further up the family tree, McCain's great-great grandfather William Alexander McCain owned a Mississippi plantation and 52 slaves, until his death fighting for the Confederacy. Before his tour of duty in Vietnam, McCain had married a model from Philadelphia, Carol Shepp. While he was imprisoned, she was in an auto wreck, thrown through her car's windshield and left seriously injured. After his return to America, McCain had an extramarital affair with Cindy Lou Hensley, whose father owned Hensley & Co., a Phoenix-based liquor company that is the nation's second largest Anheuser-Busch distributor. McCain and Shepp were divorced in 1980, and 44-year-old McCain married his 26-year-old millionaire mistress the following month. In 1981 McCain left the Navy, signing his discharge papers the same day he buried his father at Arlington National Cemetery. The newlyweds settled in the bride's home state of Arizona, where McCain went to work for his father-in-law at Hensley & Co. Months later, when Congressman John J. Rhodes announced his retirement, McCain quit the brewery business and ran for Congress. After two terms in the House, he ran for Senate in 1986. He is often described as a "political maverick" willing to take positions at odds with his party leadership. Calling it "the biggest rip-off since the Teapot Dome Scandal", he was the only Republican Senator to vote against the Telecommunications Act of 1996, and he was the only Republican Senator to oppose the Federal Agriculture Improvement and Reform Act of 1996, which ended many farm subsidies. Unlike many Republicans, he expresses concerns over global warming and other environmental issues, and he voted against the Federal Marriage Amendment. He was cozy with savings and loan swindler Charles Keating, taking more than $100,000 in campaign contributions from Keating and accompanying him on several vacations. What Keating received in return from McCain was never specifically nailed down, but McCain was admonished by the Senate Ethics Committee for showing "poor judgment". McCain used his own ethical problems to recreate his image by calling for campaign finance reform, co-sponsoring the popular if toothless McCain-Feingold Campaign Reform Act of 2002. Similarly, McCain was critical of Pat Robertson and Jerry Falwell in 2000, but grew more cordial with such leaders of the religious right as he sought election in 2008, going so far as to deliver the commencement address at Falwell's Liberty University in 2006. McCain lost the Republican nomination to George W. Bush in 2000, but emerged the victor in 2008's primaries. He chose as his running mate Alaska Governor Sarah Palin, who produced a media sideshow but inspired little confidence in the aging senator during the last months of an arduous three-year campaign. McCain lost the election to Illinois Senator Barack Obama by a wide margin. He was a solid supporter of most of the Bush-Cheney agenda, from the PATRIOT Act to the war in Iraq to his opposition of gay marriage and legal abortion. He briefly questioned whether the nation could afford Bush-Cheney tax cuts for the wealthy, but later said that in retrospect he thinks it stimulated the economy. 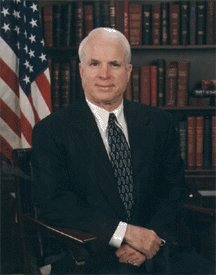 He opposed the Bush administration's relaxation of rules against torture, even pushing through legislation reiterating that America would not torture prisoners, but McCain did not complain when Bush added a signing statement noting that the new law would not apply to his administration or his orders. McCain and his wife have an estimated net worth of nearly $100M. Until recently identified himself as an Episcopalian, and in a 2007 interview with McClatchy Newspapers admitted to falsely representing himself as an Episcopalian -- as recently as May 2007 -- although he had joined the North Phoenix Baptist Church 15 years earlier. See "McCain Identifies Himself as a Baptist", Associated Press, 16 September 2007 and Jim Davenport, "McCain: Overall Faith What's Important", Associated Press, 17 September 2007. Born 1936 in the Panama Canal Zone, to military parents. The United States has never had sovereignty over any part of Panama, thus the 14th Amendment's words, "born or naturalized in the United States", do not apply. Congress passed a law on 4 August 1937 retroactively granting those born in the Canal Zone after 1904 US citizenship, nearly one year after McCain's birth. That law (50 Stat. 558, now codified as 8 USC � 1403) states: "Any person born in the Canal Zone on or after February 26, 1904, and whether before or after the effective date of this chapter, whose father or mother or both at the time of the birth of such person was or is a citizen of the United States, is declared to be a citizen of the United States." It is thus certain the McCain is a US citizen, but his status as "natural born citizen" may be questioned. Sheldon Alberts, "McCain, Heiress Wife Worth Almost $100 Million", Canwest News Service, 21 August 2008. John McCain's personal tax return reported $259K income in 2007, with Cindy McCain's last publicly released tax return, 2006, reported $6M in taxable income.